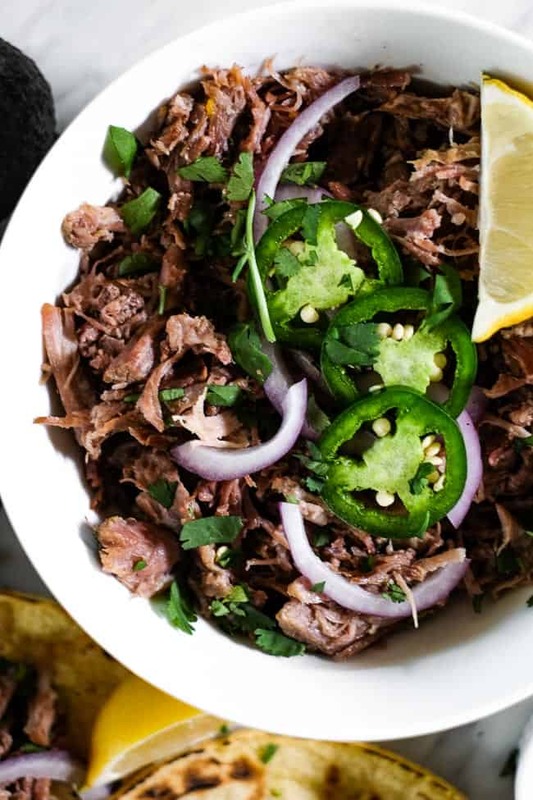 This Paleo + Whole30 leftover pulled pork hash is such a hearty and filling meal. I like to eat it for breakfast with an egg on top, but you can really have it for any meal. 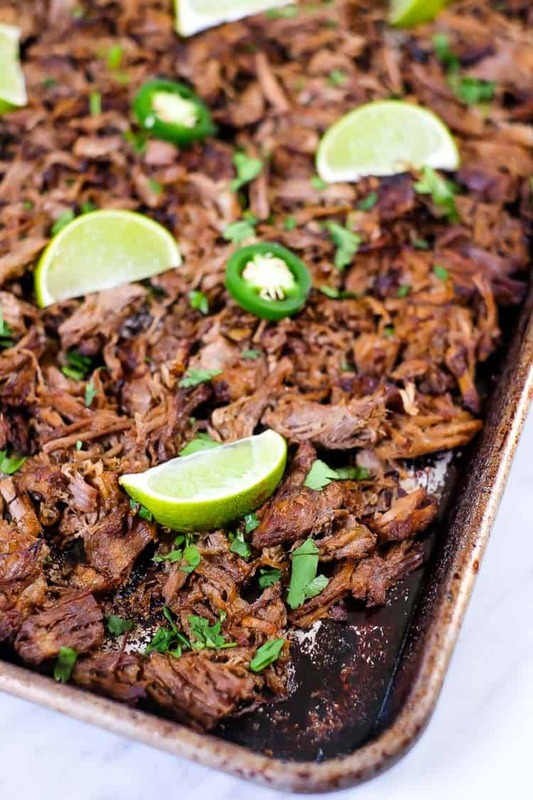 It’s a great way to use up that leftover pulled pork in a creative way. 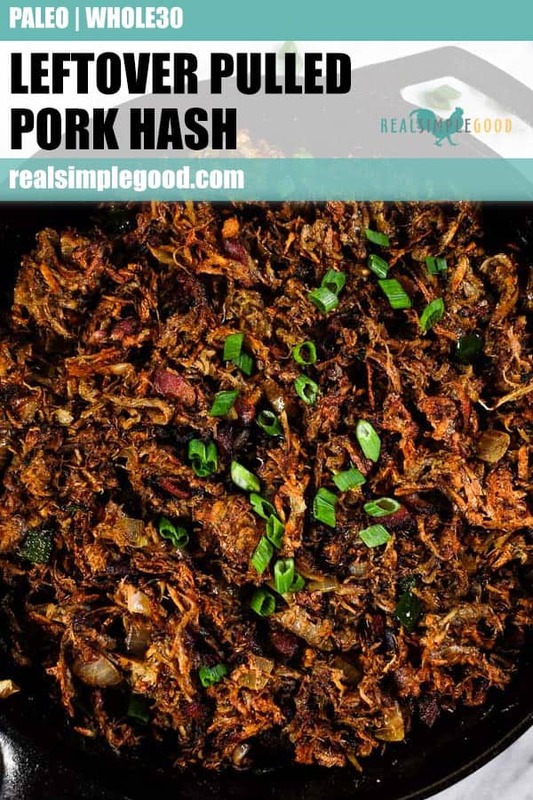 Give this healthy Whole30 hash a try the next time you make some pulled pork! It’s crazy, we must really love pulled pork around here. 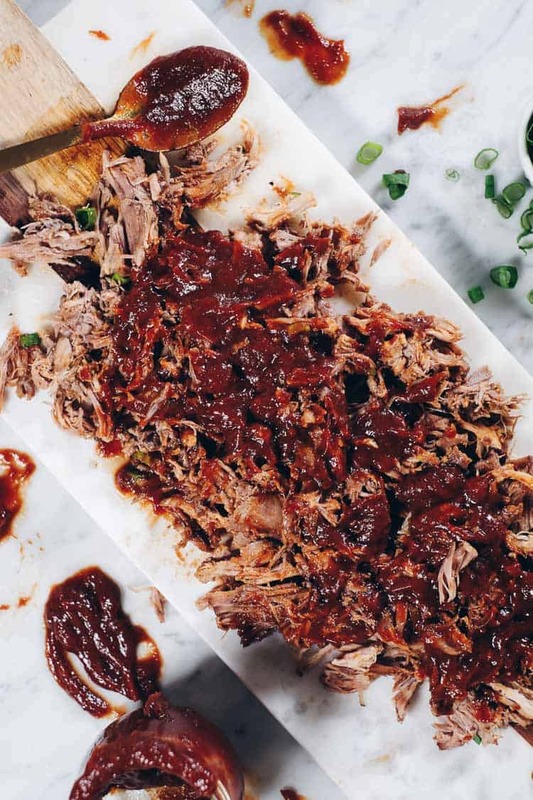 Looking back into our recipe archives, we have FIVE different versions of pulled pork recipes. Lucky for you huh? 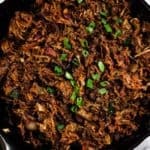 You have plenty of options and flavors to choose from when you decide to make this leftover pulled pork hash! 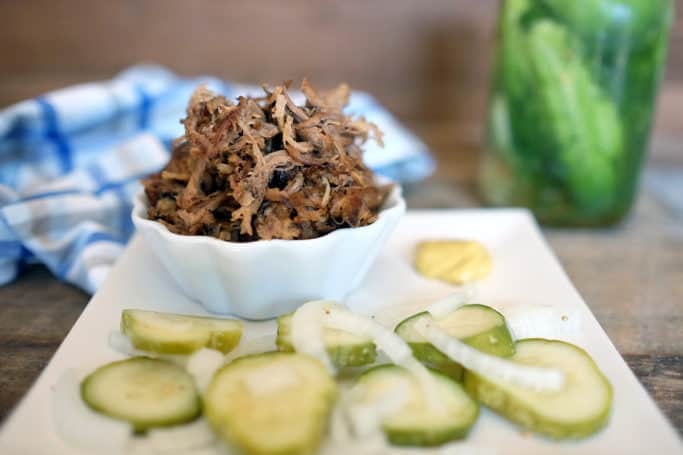 We put links to all of our pulled pork recipes in the recipe notes and the post below so you have them all in one place. We’ve found that an easy way to get perfectly browned and crispy hash browns is to bake them in the oven on a sheet pan. Whenever we try to cook them in the skillet, they seem to get crispy on the outside and stay kind of mushy in the middle. Sound familiar? However, if you spread them out in an even layer on a sheet pan, you just have to flip them once and you’ll get some perfectly browned, slightly crispy hash browns. Just watch them closely at the end so they don’t get too crispy and burn! 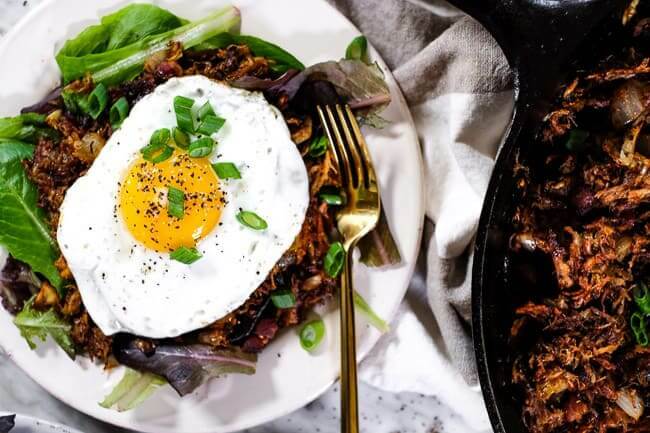 We love that this leftover pulled pork hash is versatile and you can switch it up to make different versions and flavors. You could eat it plain for lunch over some greens, put an egg on it for breakfast or top it with some shredded cheese if you eat dairy. Any way you slice it, you’ll be enjoying a rich and filling meal for breakfast, lunch or dinner! 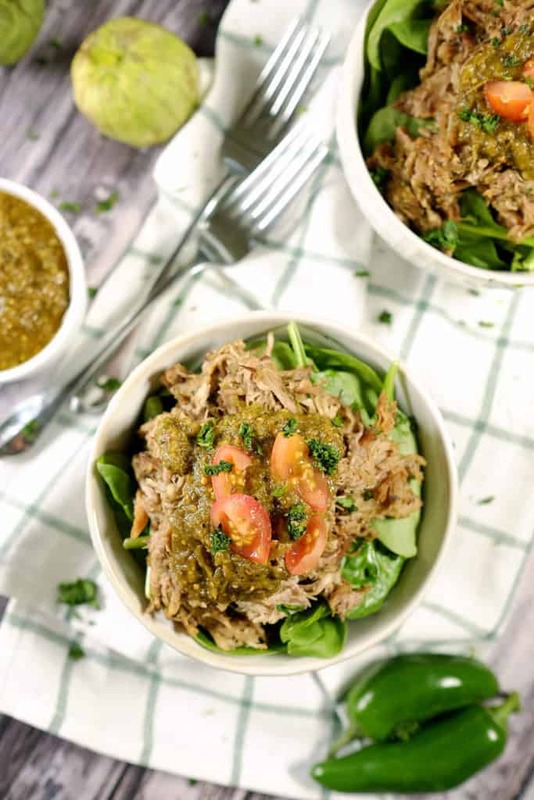 Looking for a delicious way to use up that leftover pulled pork? 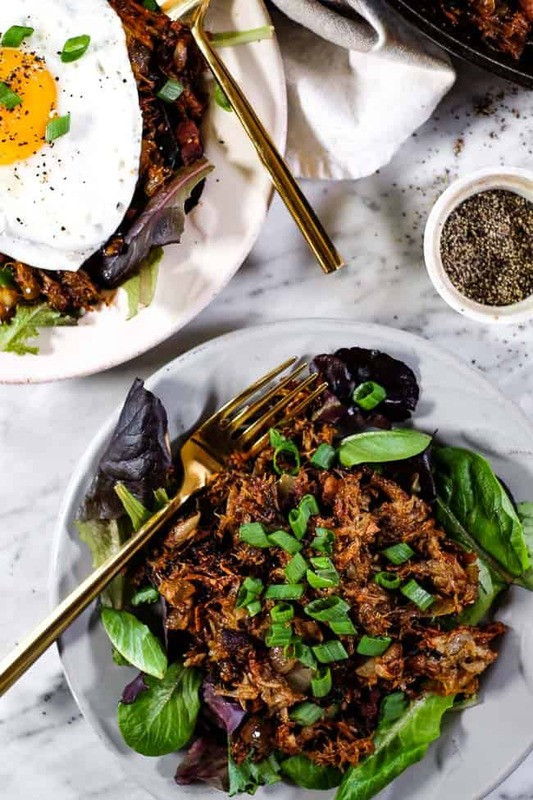 Plan to make this pulled pork hash and then mix up the toppings to have it for breakfast, lunch or dinner! Leave a comment below and let us know how it goes. Also, take a pic to share on Instagram! Tag us @realsimplegood so we can see, and give us a follow if you don’t already! We’d love to stay connected! 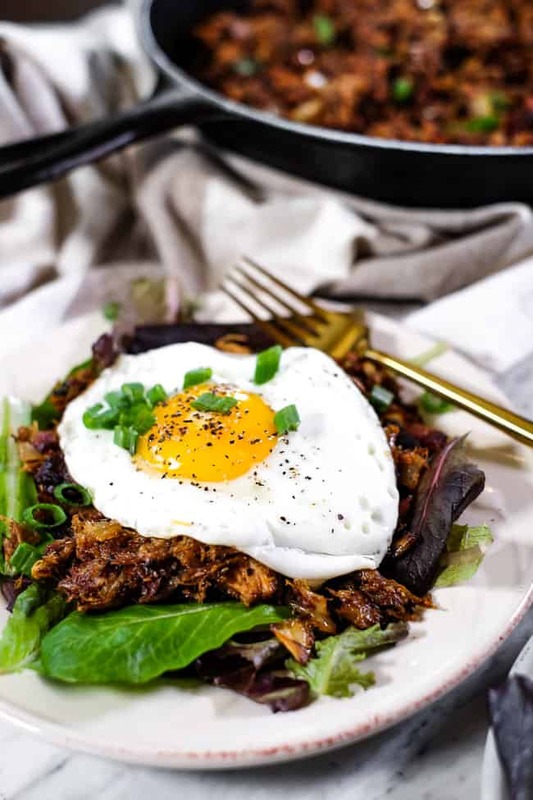 A delicious way to use up leftover pulled pork, this Paleo + Whole30 pulled pork hash is so hearty and filling. 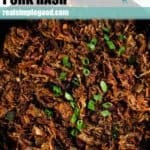 It's a hash to feed the whole family! Make the seasoning by mixing all of the seasoning ingredients in a small bowl. Preheat oven to 400° Fahrenheit and grease a large sheet pan with ghee. Shred potatoes into hash browns and toss with seasoning mix. Spread potatoes out evenly in a single layer on the sheet pan. Place in the oven to bake for 15 minutes. Remove sheet pan and flip the hash browns, breaking them up as needed. Place back in the oven to bake for 5-10 minutes, or until they are browned and cooked as desired. Watch them close at the end to prevent burning. While the potatoes are cooking, prepare bacon, onion, pepper, cheese (optional), green onion (optional) as noted. Heat a large skillet over medium heat and add bacon. Cook, stirring occasionally, until the bacon is cooked and starting to get crispy, about 7-8 minutes. Remove and place on a paper towel lined plate. In the same skillet, add in onions and peppers to cook until softened, about 5-6 minutes. At this point, remove the skillet from heat until the potatoes are done. 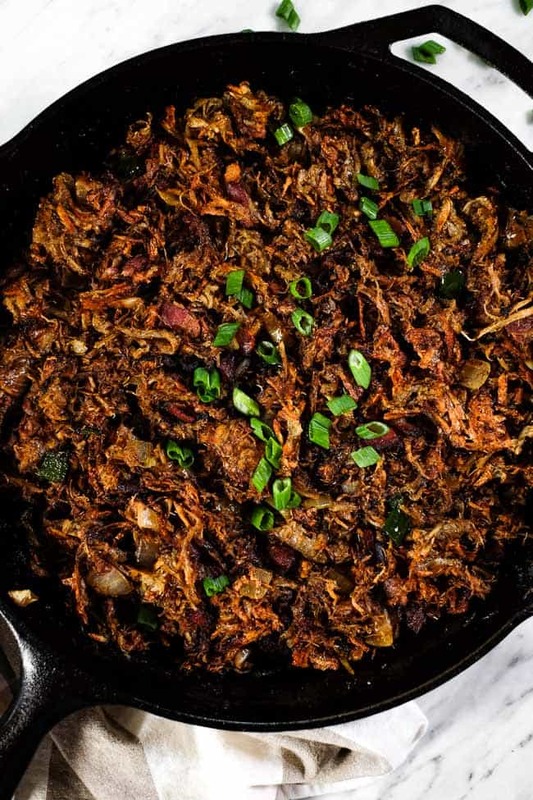 Once the potatoes are finished, heat the skillet over medium heat and add in the leftover pulled pork. Stir to reheat the pork for 5-6 minutes (or longer, if you want to get some good crispy ends and bits). Next, add the potatoes and bacon and mix. Taste and season with any additional salt and pepper as desired. If you are adding cheese, turn heat to low and top with cheese. Cover and cook until cheese is melted. Serve pulled pork hash topped with an egg cooked to your liking (optional) and green onions (optional) for garnish.